I read an article that stated that the human brain contains 60% fat. Is this fatty tissue structural building material? Or does it just serve as an energy source for the mitochondria? Since our body are also made out of 70% water, is there also a water in our brain? And the most important question I want to ask is: what percentage of the brain is actually a neuron? The brain has a lot of a fatty substance called myelin. It wraps around nerve fibers and enhances the speed of electrical communication between neurons (source: Brain Facts), and increases transmission efficiency (Fig. 1). It is produced by supporting cells in the brain called oligodendrocytes. Myelin is really just many wraps of membrane, and since neurons have long axons and dendrites, too, they also have a lot more membrane than if they were just spherical cells - all of this membrane is "fat" called phospholipid. Is this fatty tissue structural building material? Or does it just serve as an energy source for the mitochondria? 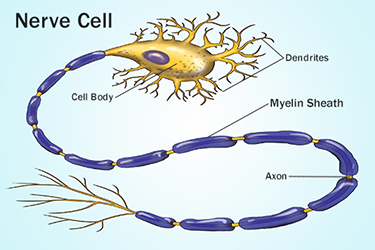 Myelin and cell membranes are the most abundant fatty substances in the brain - they are structural fatty substances found around cells and neuronal axons, respectively, and they are not fuel. [I]s there also a water in our brain? [W]hat percentage of the brain is actually a neuron? Scientific American performed a review on this and settles on a ratio of neurons : glia cells of 1:1 (although numbers of 10:1 have been reported). Glia are the brain's supportive cells and include the oligodendrocytes as mentioned above that produce the myelin (Jabr, 2012).